I’ll always admire a winery that puts their wines up non-blind against the benchmarks of the world. I mean, it’s one thing to upstage with the subterfuge of a wine served blind, but it takes confidence to do the same with a sighted tasting. Even more confidence is required when your winery doesn’t have the longest history with Pinot Noir, with Shaw & Smith’s reputation more focused upon Shiraz, Sauvignon Blanc and Chardonnay rather than Pinot Noir. Still, as the tasting below shows, the Shaw & Smith Pinot has come along in leaps and bounds in recent years, with 2013 easily the best vintage to date (even if it’s still not quite ‘there’). Couple that with the new Tolpuddle Vineyard Pinot Noir and it suddenly makes much more sense that Martin Shaw & Michael Hill-Smith have decided to focus on Pinot Noir for this Workshop. As an aside, there is some serious generosity behind a tasting like this. Sure, it’s a PR exercise, but the sales push is never on with Michael and Martin, and the expense involved would be hefty. 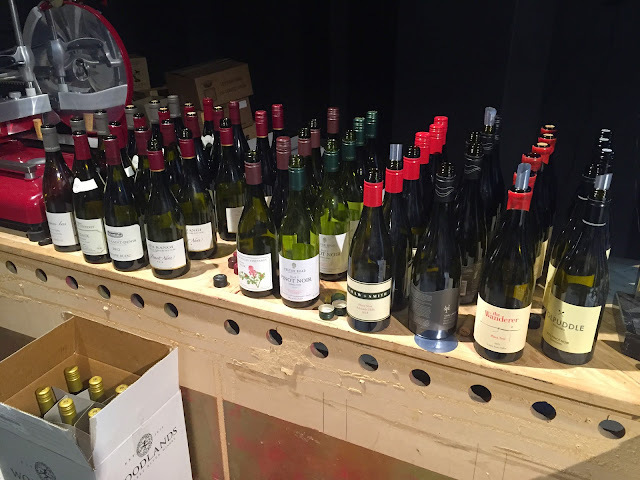 Wineries like Shaw + Smith or Voyager (with their annual masterclass) ought to be commended for putting on annual comparative tastings like this, as I think we all benefit – winemakers, trade, media. Everyone. Notes are as written on the day. Extra bits in italics. From 2 parcels 1.02h in total. Certified organic since 2005. 1/3 whole bunch. 40% new oak. From a 0.45h parcel in the lieux-dit of Les Treux where Clos de Vougeot meets Grands Echezeaux. 100% whole bunch. 2 years in 50% new oak. 2.93ha of village level holdings, 75% of which is farmed organically. Short maceration, typically 12 days between picking and pressing. 40% new oak. Up to 100% whole bunch. Predominantly from the Home Block. Abel, Pommard, Dijon clones. 10-30yr old vines. Destemmed. 25% new oak for 11 months. Hand destemmed. Home cultured yeast. Foot crushing only. No pumps or filtration. The Elms Vineyard, Bannockburn. 26% whole bunch. Long pre ferment maceration. Wild yeast. 18 months in 37% new French oak. Balhannah and Lenswood. Hand picked with whole berry and whole bunch ferment. Pre and post ferment maceration. 10 months in 1/3 new oak. 16yr old vines. MV6. Destemmed. 3-4 days cold soak. 30% whole bunches. 30% new oak. 11 months in barrel. 30% whole bunch. 70% whole berries. 15-20 days on skins. 30% new oak for 10 months.